What is it about Sigur Rós music that just makes you want to add visuals to it? It’s literally made for scoring a film it seems. So it makes sense that the Icelandic avant-rockers would hold their own little film festival of sorts for their new album “Valtari.” It’s a two-fold project (called The Valtari Mystery Film Experiment) consisting of a number of filmmakers whom have been invited to direct a video for one of the songs on the album, and an open call to all other filmmakers (in the form of a contest really) so they can also make their own videos for one of the songs on the album. Sigur Rós releases one new video a week on their site from the collection of filmmakers they’ve collated. Truly an infuriating piece of filmmaking for me, I am torn between the things about it I love and those things about it which I loathe. Let’s begin with the love. Shia LeBoeuf’s performance will for a long time be indelible from my mind. I watch a lot of films in my work and I have a weird habit of not liking to know too much about what I’m about to see before I see it. So unless I’m trolling for something specific, if I find a film to watch I initially intentionally avoid looking at anything about it except maybe who the director is, and in the case of music videos, the musical artist. Initially, when I viewed this short video, I thought he looked familiar but couldn’t put a name to the face. I was so compelled by his performance as “Man” though, that I when I saw who it was playing the role, I couldn’t believe it my eyes. LeBeouf’s performance is heart-rending and real. When he smashes his hand through a glass frame, I found myself wondering if he actually smashed his hand though a glass frame and cut it. The award-winning director Alma Har’el seemed to truly be able to connect with these characters. The female lead who plays “Woman” is also phenomenal. Both of them together have a similarly cosmic and combative chemistry that is completely engaging. The story is conceptually strong and metaphorically powerful, while not being blunt or compromising any artistry. Man and Woman start off having a close, connected and intimate relationship, when all of a sudden – quite literally – the winds of change blow through and force them down a path that tries their love at its very core. While the film takes a sillier turn at this chapter, it quickly redeems itself and regains traction as the couple finds themselves locked in an unforgiving downward trajectory of anger and repulsion. Eventually, and almost subconsciously expected, Man ultimately kills Woman and then realizes what he’s done as something permanent and life-altering (it’s a little hard not think of Sid and Nancy here, but the unique touch Har’el adds at the moment of impact quickly snaps you ou of it). The fact that they lived in a bedroom of deceased and well-preserved butterflies, is almost a slap in face admitting that one of them should’ve seen this coming – for they were always trying to hold on to something that would forever leave them one day anyway. How many butterflies must be caught before the captor realizes they’ll never stop being another one out there to catch? Even more interesting is the disjointed narrative which essentially depicts at the onset of the film, as Man and Woman dance gracefully with each other like winged insects themselves, that none of the preserved butterflies are on the wall and there are faded shadows resembling the ghosts of where there used to be something beautiful, caught, pinned and on permanent display. I assume it’s post-death of Woman when we open with this scene, maybe a memory Man has captured for a moment in time. What’s wrong with this short film is the sloppy detour it takes mid-way through the story. I like the realistic depiction of a metaphor, and I like the aggressive etherealness of their dream-state, but the direction of this segue and the look of it was jarring and overblown. Finally, I wish there was more collusion with the music, but honestly this was the first Sigur Ros video I think I’ve ever seen where I cared less about the song than I did about the video. I think the beauty and fragile artistry of both mediums in this case worked against each other and one is lost for the other. I’d love to see this film with a less notable “soundtrack” and watch a video for “Fjögur Píanó” with a less engaging narrative. If you have never witnessed Sigur Rós as a live show, you should do yourself a favor and take the next opportunity you get. I had the rather rare opportunity during their first-ever American tour to see them in the dank confines of a pre-Katrina New Orleans House of Blues, and let me just say, I’d never once before and have never once since been to a concert where the crowd was so enveloped by the music that during a quiet moment in “Viðrar vel til loftárása” you could literally hear a pin drop – no one was chatting, glasses never clinked together, and everyone just stood watching in sheer amazement. Aside from being the phenomenal musicians and artists that they are, they are outstanding live performers. As expected, they’re not prolific US tourers. A few years back they released a concert film called Heima which was a fantastic way to experience all they have to offer both sonically and on stage. Surpassing that, we now get another glimpse of their ethereal live experience in the new concert film INNI. Debuting recently at the Venice Film Festival, it’s now playing in some select cities and also available to purchase. Below is a promotional clip from it called “Festival” which runs about 7 minutes long and while giving you a fantastic excerpt of what they’re like live (just wait till about 2 or 3 minutes in), the filmmaking is also replete with Alphaville-like strobing lights and Murnau-esque, grainy, saturated black-and-white imagery. You only get snippets of the score when viewing this long trailer, but you can download or listen to a complete piece called “Colouring Of Pigeons” at The Knife’s website. Apparently they collaborated with another two artists, Mt. Sims and Planningtorock. Both have MySpace pages, and after following this thread a little too far I was actually pleasantly surprised by the Berlin-based Mt. Sims MySpace-posted songs. Give them a listen too. The CD soundtrack for Tomorrow, In A Year will be available March 9th via Mute Records and is a double-disc set. 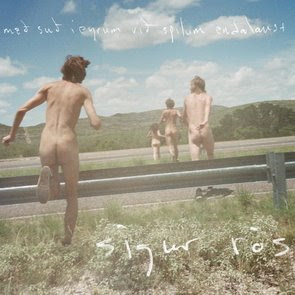 Sigur Rós have always been an eclectic band, but to go so far as recording an album in the states! Crazy! And produced by Flood? With words in English? Bizarre! In the promo video for this obviously incomprehensibly titled Sigur Rós track (“Ba Ba Ti Ki Di Do” anyone?) we find the band exploiting not those with gender confusion, post-apocalyptic existence or Down’s Syndrome, but instead nudism. A troupe of naked boys and girls flop around in various visual textures (water, leaves, dirt) while their exposed parts flop around with them. There is no overt explanation that I can find for this concept, but they seem to be running away from something off screen. Or maybe i’m just looking for a hidden meaning instead of acquiescing to the fact it’s likely just pure corporate promotional reasoning. Personally, I’d rather watch their earlier videos, but I have to admit I dig this track “Gobbledigook.” It reminds me of a lighter (read: less eclectic) Einstürzende Neubauten, and you can definitely pick out the Flood production traces. Check it out for yourself below.